Louise de Guéhéneuc, duchesse de Montebello by Pierre-Paul Prud’hon, early 19th century. The 19th century cap was a modest necessity. 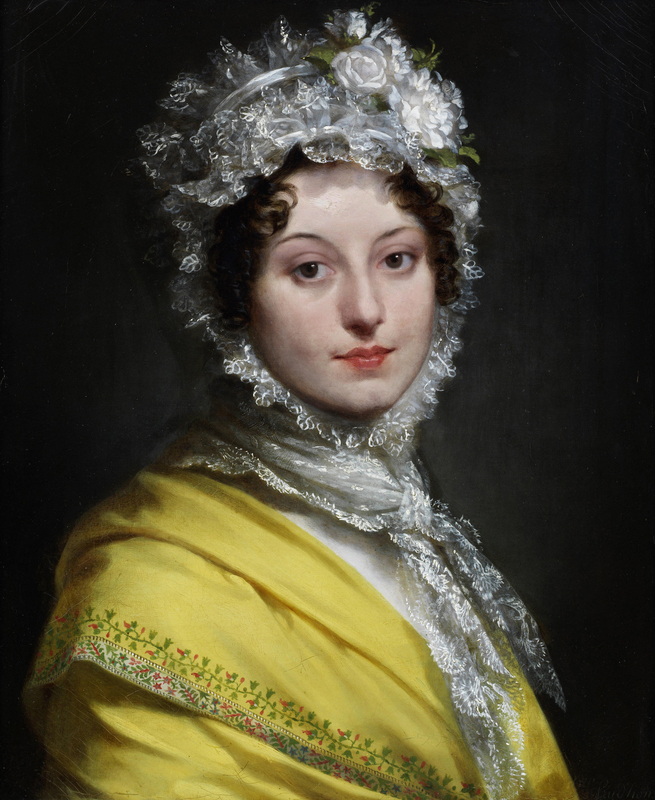 Worn by spinsters and matrons both young and old, it neatly covered a lady’s hair while she was at home and abroad. At face value, such a basic article of clothing seems to have changed little throughout the century. 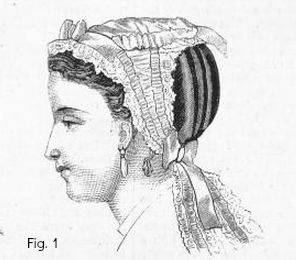 However, a closer look at the fashionable caps of women of the 1800s reveals that styles did in fact subtly evolve. 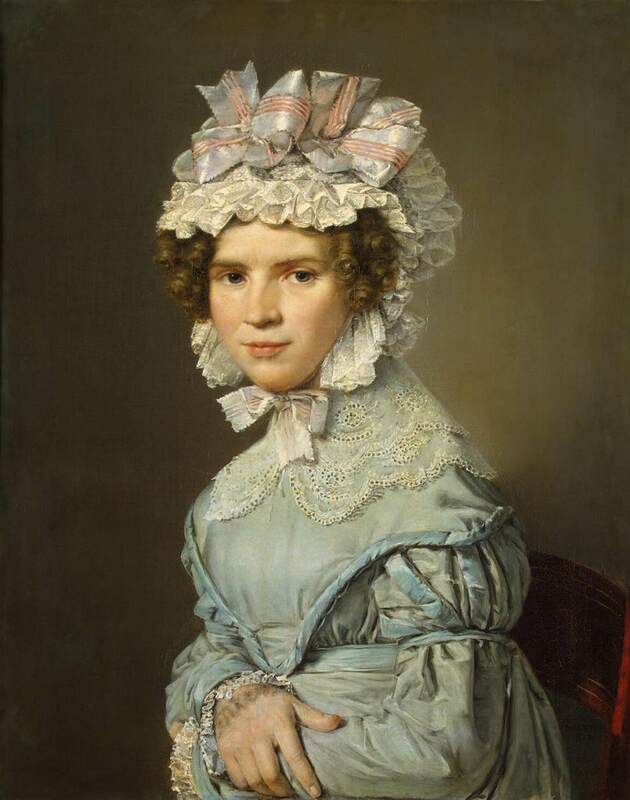 Through lace, ribbons, and trimmings, ladies of the age continually reinvented the cap, transforming it from what might otherwise have been a merely utilitarian scrap of fabric into a fashionable, feminine confection that said as much about a woman’s personal style as her French bonnets, cashmere shawls, and India muslin gowns. 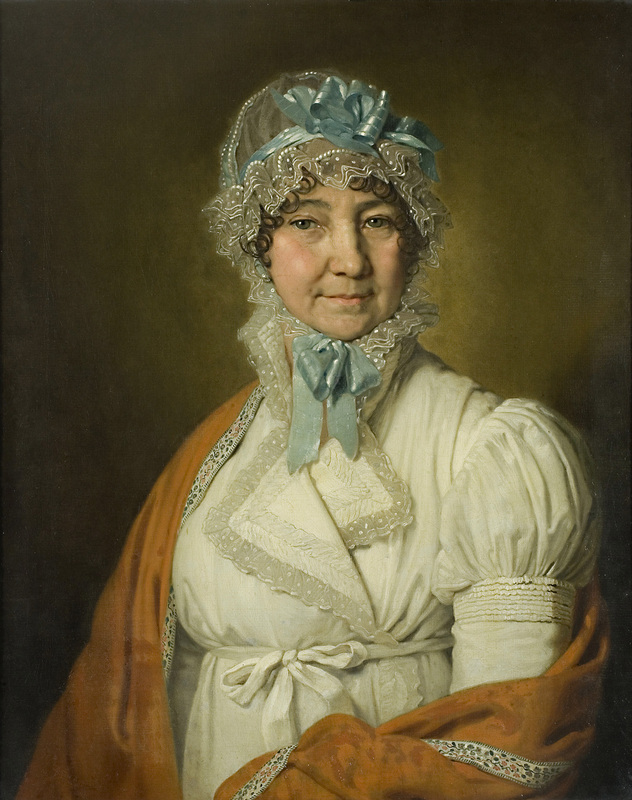 Portrait of Nadezhda Dubovitskaya by Vladimir Borovikovsky, 1809. “Six elegant English lace caps, trimmed with the most beautiful English laces that could be procured. “Two Valenciennes lace caps trimmed with Valenciennes lace, forming a coronet round the top, which has a very pretty effect. “A Brussels point lace mob cap, with beautiful rich trimmings of point lace. “A very superb cap of Brussels point, quite a new shape: this cap is most elegantly trimmed with a point, and the new double-sided satin ribbon. “A Mechlin lace cap, beautifully trimmed with Mechlin lace, and lined with white satin. 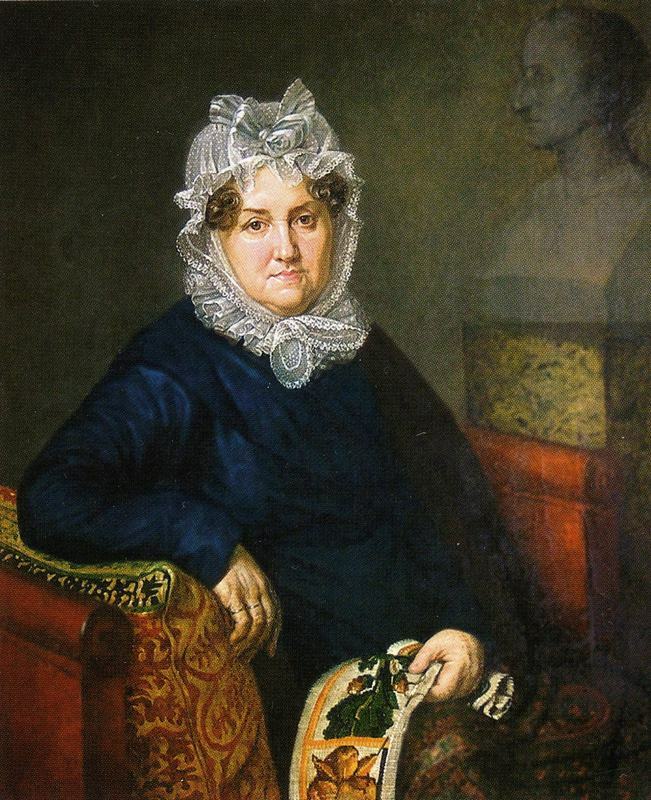 Portrait of Elizaveta Olenina by Alexander Varnek, 1820. 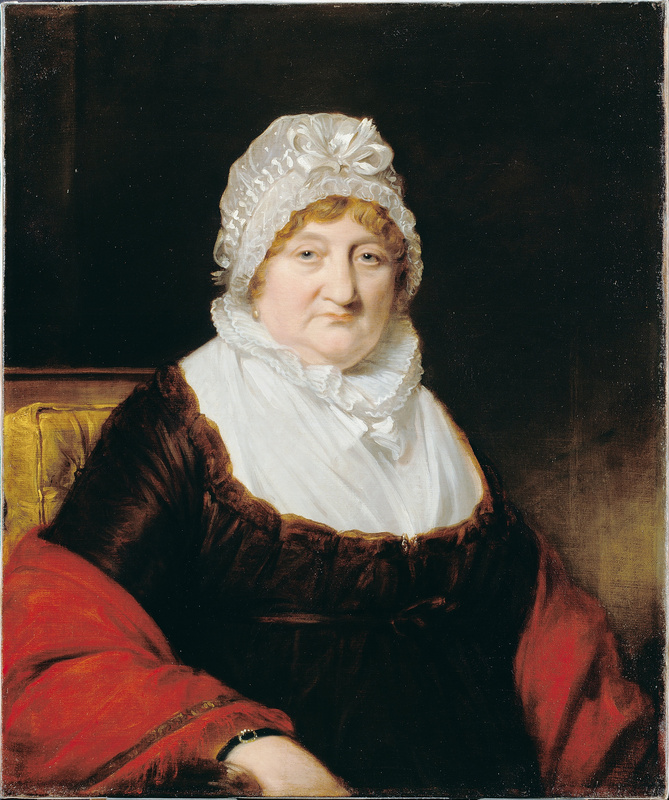 Mrs. Thomas Linley by James Lonsdale, 1820. Princess Catherine of Wurttemberg by Franz Seraph Stirnbrand, 1820s. 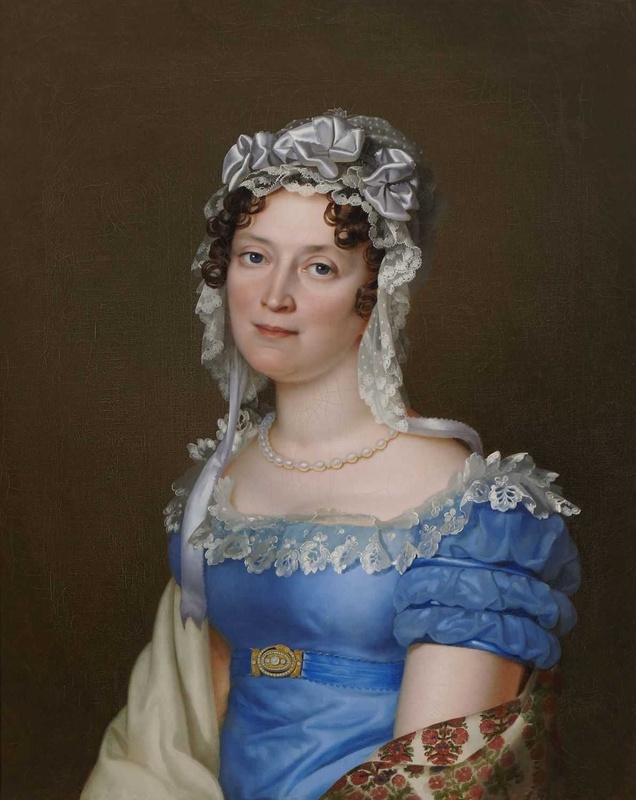 Portrait of a Lady in a Blue Dress by Christian Albrect Jensen, 1824. Though seldom cap should be admitted there. Or any other tiny flowers of May. Lest in “the pride of place” it break through Fashion’s laws. 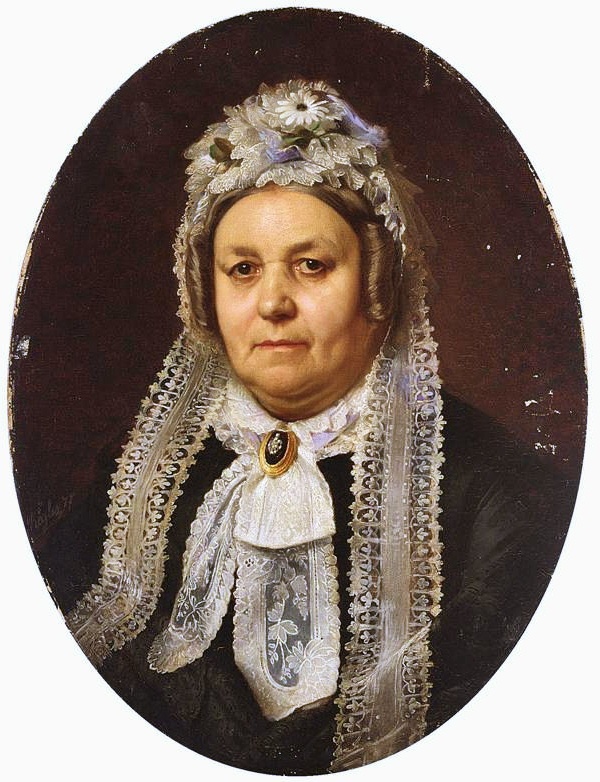 Woman in Black Dress and Lace Cap, mid-19th century. “The prettiest caps for very youthful matrons are of a very small size; they are composed of rows of blond or lace, each divided by a very small wreath of red clematis: this style of garniture has the effect of the hair being strewed with flowers. The trend for simpler styles in caps continued into the middle of the next decade. Godey’s Lady’s Book of 1870 describes a “small lace cap, trimmed with rose-colored ribbon.” Smaller still, they report a coiffure accented with nothing more than a “small fancy piece” of Valenciennes lace and green satin ribbon. Morning caps, however, sound little different from earlier decades. 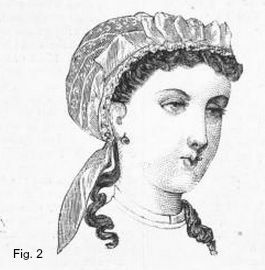 Godey’s describes a simple morning cap of muslin, trimmed with lace and “cherry-colored ribbon” which one can imagine as easily on the head of Jane Austen’s Mrs. Bennet as covering the Victorian curls of Elizabeth Gaskell’s Mrs. Hale. 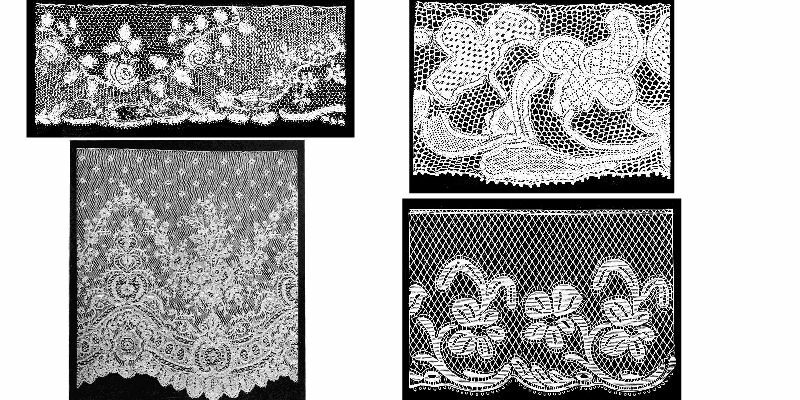 Valenciennes Lace, 1875-76; and Mechlin Lace, 1903. An example of Blonde Lace , France, 1830s. Caps were seen throughout most of the 19th century. Whether on a young spinster or an old maid, a newly married lady or an elderly dowager, the cap was a symbol of that stage of female existence when frivolous youth had passed and sober adult living had begun. Such a garment could easily have ended up a sad, drab bit of fabric which robbed its wearer of her femininity and youthful charms. Instead, the 19th century cap was an imminently stylish accessory, the beauty of which owes as much to women’s innate ingenuity as it does to fashion. “Fashions.” The Lady’s Book. Vol. 80. Philadelphia: L. A. Godey, 1870. “Fashions for December.” The New Monthly Belle Assemblée. Vol. XXV. London: Norfolk St, 1846. “Coiffures.” Harper’s Bazaare. New York: Hearst Corporation, 1867. De Courcy, Margaret. Ed. “London Fashions for the Month.” The Ladies’ Cabinet of Fashion. Vol. III. London: Geo. Henderson, 1840. “General Observations on Fashion and Dress.” La Belle Assemblée: Or, Court and Fashionable Magazine. Vol. X. London: Whittaker, Treacher, and Co., 1829. 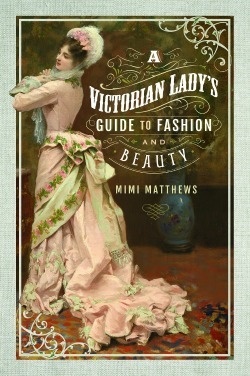 “The Guide to Dress.” The Lady’s Book. Vol. 6. Philadelphia: L. A. Godey, 1888. Hone, William. Hone’s Authentic Account of the Royal Marriage. London: W. Hone, 1816. The Ladies’ Monthly Museum. Vol. XII. Vernor & Hood, 1820. “Lingerie.” The Warehousemen and Drapers Trade Journal and Review of the Textile Fabric Manufactures. Vol. V. London: Wine Office Court, 1876. Littell, Eliakim. Ed. Littell’s Living Age. Boston: T. H. Carter & Co., 1844. The Maids, Wives, and Widows Penny Magazine, and Gazette. Vol. 1. London: G. Berger, 1832. “Paris Fashions for June, 1857.” Blackwood’s Lady Magazine. Vol. XLII. London: A. H. Blacwood, 1857. “Parisian Fashions.” The Lady’s Magazine. Vol. XXXI. London: G. G. and J. Robinson, 1800. Some of these are so pretty. I always remember Sir Gareth taking umbrage at a Lady Hester’s cap (and it ending over one eye after she has been hiding behind the curtain among his coats) and it seems to met hat that is when he first notices her as a woman and not just the shadowy friend of his lost love. But some of these caps would have been quite unobjectionable, surely, even to a Corinthian? I definitely think the fashion conscious Corinthian wouldn’t mind if his lady wore a stylish cap on occasion. I remember in the end of Lady of Quality that Annis puts on a particularly fetching cap to greet Oliver Carleton in her room. I was so tempted to include Heyer tidbits in this article! But the Heyer poll is already coming this week, so I had to restrain myself ;) Thanks for commenting, Jenny! British washing net–now I know that it wasn’t just for laundry! I had a chuckle at that, too. Especially considering that they didn’t think English lace was good enough – but washing net? No problem! I really wish we could wear caps today, they are so pretty and would make my constant bad hair days a thing of the past. Why spend all that time with straighteners/diffusers/tongs/products when we could all just go to Hobbycraft every weekend and buy buckets of cap trimmings to stick on our heads. We need to start a new trend…. I would love to wear frothy nonsenses of caps. And hey, fascinators are in fashion, why not take it the step further? I am seriously thinking about it, especially with winter coming up. You can lose up to 1/3 of your body heat through the head. I’m not sure one of the little cobweb lace caps would keep much heat in, but some of the muslin mob caps might. Caps and Hats really need to make a comeback! And just think of all the Christmas/Easter/Halloween themed fun to be had! A stylish hobby that keeps us warm? We’d be mad not to bring caps back. and no reason to stick to traditional colours of white, blonde or the later ecru. I fancy myself in a pumpkin orange mob cap with black silk roses for halloween… because fabric roses are immensely easy to make without any special materials. Proper job! I love the patterns, Mrs Roberts, very fetching! Exactly! Caps could be quite fashionable, as I hope I’ve shown. 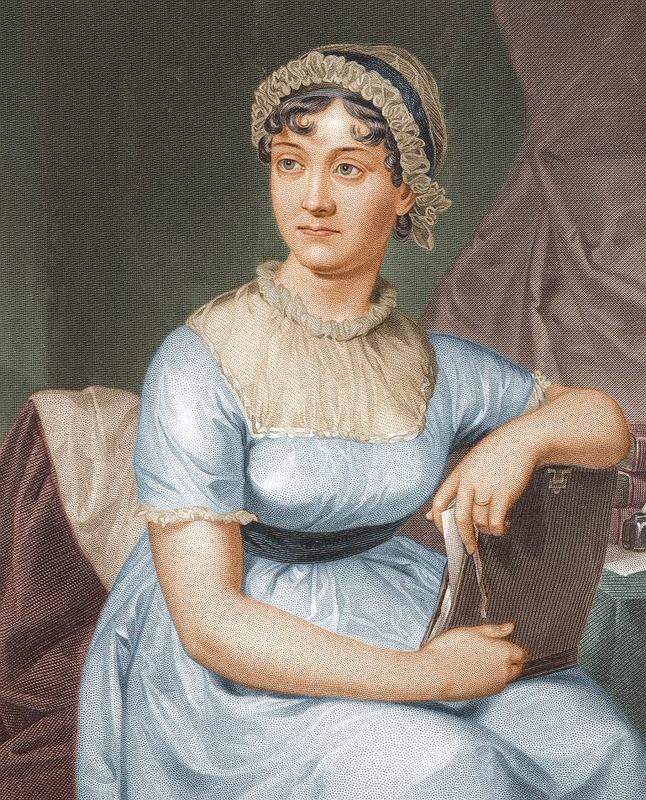 I think modern folks imagine them all to look like Betsy Ross-style mob caps, but there really was an infinite variety of lace, ribbon, and trims to make the 19th century cap much more frothy and feminine. Once again, a lovely and informative post! My comment is très de trop, but while I admire the delicate lace and prettiness of the caps, I just cannot make myself like them for much past a sleeping cap. I honestly don’t know what about them makes me think so – because they are absolutely beautiful – but my mind just thinks drab and shelved spinster rather than distinguished matron. I would, however, heartily support the return of the bonnet! Thanks Renee :) And your comment is not at all de trop. I totally understand it. In fact, when I am writing, I dread having to put a cap on my heroine. I also would far prefer her to have her hair down than up, truth be told. My research on caps was in part to convince myself that they could be something feminine and beautiful – as opposed to a symbol of spinsterism. But froth and frill have their time and place, and caps should make a comeback!